This month we held Tiny Ideas, which coincided with the end of Maddy Costa and Jake Orr’s Residence Hideaway, so they shared the ideas they’d been working on as well. We really enjoyed hosting Maddy and Jake, as their work both mostly focuses around writing for and about theatre and the arts, so it was a different kind of residency for us all to engage with. They’re collaborating on a new project called Dialogue, which aims to challenge and open up the ways in which we think about critics and critical writing. Jasmine Loveys also showed us all the beginnings of a new performance project, ‘It’s a Badger Trap’ which will have it’s first outing as a work in progress at Hatch, Nottingham. Jasmine started collecting badger related objects when she was little – puppets, ornaments, cushions, candles, t-shirts – and recently re-discovered the collection in her dad’s garage. 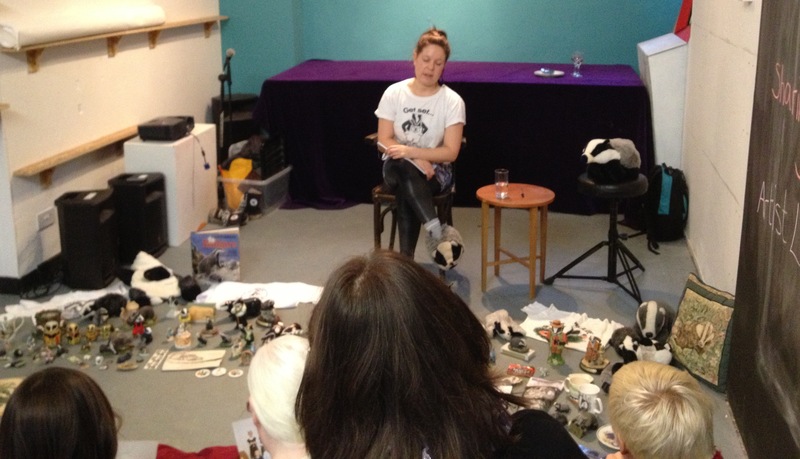 She showed us her collection and we talked about potential ideas in relation to the badger cull debate. Ella and Nicki also talked about the beginnings of a research project exploring crop circles, in early stages.